The new, improved e18 PowerShift transmission with Efficiency Manager has been designed to increase efficiency and operator productivity. In addition, hydraulic flow has been increased to 435 litres/min, giving these tractors plenty of capacity to handle large implements with ease. 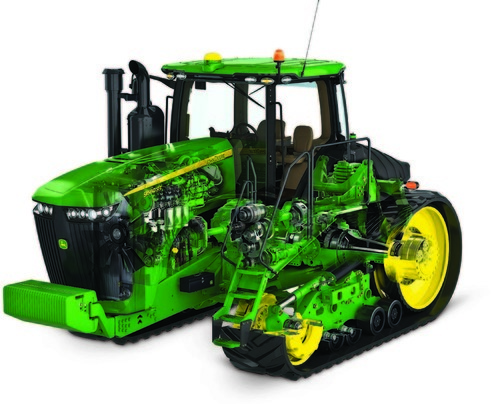 An industry exclusive feature is the HydraCushion suspension system on the 9520R, 9570R and 9620R models. Located on the front axle, HydraCushion suspension eliminates power hop to ensure operators can get all of the available horsepower onto the ground. The new CommandView III Cab provides increased operator comfort and ease of operation, with a redesigned CommandARM featuring a John Deere 4600 CommandCentre display for convenient control of all tractor functions and settings. This puts everything at the operator's fingertips, while sitting in a seat that can swivel 40 degrees to reduce strain when viewing rear implements. All the tractors come with a new premium LED lighting package for unmatched work illumination at night. Optional Active Command Steering, another industry exclusive for four-wheel drive tractors, provides improved steering at high transport speeds and reduces steering effort in the field. The new John Deere 9R/9RT Series tractors are also available ex-factory with John Deere’s latest FarmSight technology solutions, along with dealer value-added services and support. These include AutoTrac automatic steering, JDLink telematics, iTEC Pro headland management, ISOBUS and new Remote Display Access and Wireless Data Transfer options.